Let’s see. What all do I have going on now? I think that about covers it. Oh no, wait, I joined another group! 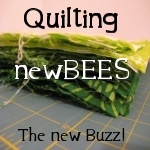 It is a quilting bee for beginners (or really for any skill)! It is going to be so much fun! Each month, except for November, I will have a package of fabrics sent to me. I will make the designated quilt blocks out of the fabric and mail it back to the sender. Then in November it is my turn to send out fabric and receive back finished blocks in return! My head is atizy (is that a word) with all the possibilities! My grandma says I get to many irons in the fire, but the stove hasn’t blown up yet so I presume I can probably handle a couple more and be fine!